The figure used for this unit is a modified Heroclix figure from the Batman set. Its model number and name is #003 / Arkham Asylum Guard. Character Bio - Axey Smartist is a police officer who found a firefighter's axe and now uses it when fighting crime. Married to his job, he works the always shift by sleeping for only two minutes. At night he wears a black cat suit and kills bad guys in their sleep. His battle cry is "I will chop your heads off!" When faced with a challenge, he will hold "try outs" to build a team. His only weakness is that he melts when he is surprised. He is rarely surprised. 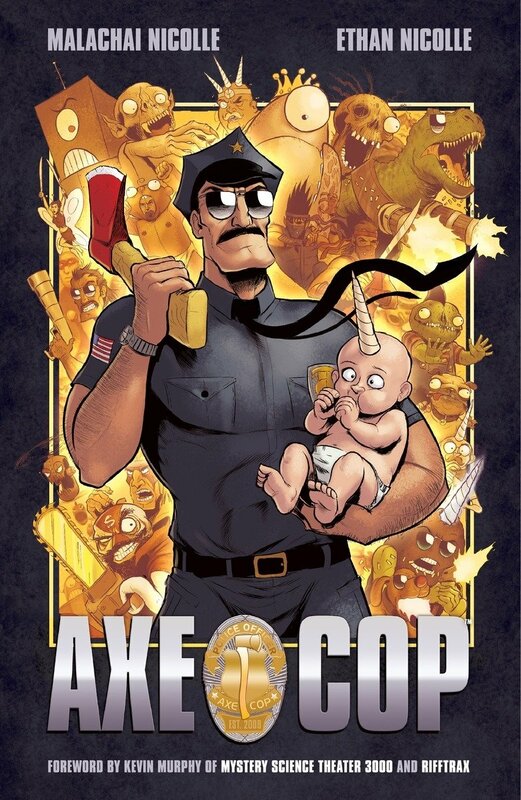 Axe Cop is an Event Hero and follows Event Hero rules. As a figure with a secret identity, Axe Cop has these Secret Identity Synergies. As a Human, Axe Cop has these Human Synergies. As a Lawman, Axe Cop has these Lawman Synergies. As a figure with a secret identity, Axe Cop interacts differently with these special powers. As an Event Hero, Axe Cop interacts differently with these special powers. As a Human, Axe Cop interacts differently with these special powers. As a Lawman, Axe Cop interacts differently with these special powers. Last edited by Karat; April 1st, 2019 at 12:48 AM. Start the game with 8 white Nope Markers. After revealing an Order Marker on this card and before taking a turn with Axe Cop, you may take a turn with a Unique Hero you control without a Nope Marker on its card. If that Hero does not inflict a wound on an enemy figure during that turn, you must place a Nope Marker on its Army Card. Order Markers cannot be placed on Army Cards you control with a Nope Marker. If a figure with a Nope Marker on its Army Card would take a turn, Axe Cop must take the turn instead. "ALL BAD GUYS MUST DIE!" After attacking an enemy figure with Axe Cop, if he did not inflict a wound, he may add 1 to his Attack number and attack again. "YOU SURPRISED ME AND NOW I'M MELTING!" If Axe Cop is attacked and at least 1 skull is rolled, roll the 20-sided die. If you roll a 1, you cannot roll defense dice. This roll cannot be modified by any special power. Should the melting power only work on attackers who were not engaged with Axe Cop at the beginning of the turn? Just to sell the surprise aspect? Also what’s the mini situation? Looks like a fun design! I don't want to complicate it too much or make it too difficult to bring him down. Just assume they were hiding or playing dead or something. As for the mini, I'd really like a cop with sunglasses and then we can glue an axe in his hand. Any suggestions? Figures are meant to be established before a design thread is posted, these days. This should probably be put On Hold. Maybe a mix of these plus an Axe? I'd prefer it if we could try to use Heroclix here. That looks like it'd be difficult to pick up over in the U.K. and Clix has no shortage of police figures. Well i was just looking for his preference of sunglasses as all the clix ones have none. Maybe use the clix as the official and then mod something more thematically appropriate for an official alternative? Hmm... that is a fair point. Don't suppose there are any good options for a head-swap?